I have come to realise that I am taking small breaks from my blog during my Request Chronicles, because I basically need a break xD They only last between one to two days, but I feel so guilty for not posting! But believe me, I still have around 16 to go. 3 x 16 is what? I have no idea! Though to be honest, some people have only posted one or two requests, so yay! Anyway, we need to head back into the Requests. What shall I be looking at today? Here's a pleasant little blast from the past concerning Morning Musume. Sakura Mankai, sung by Sakura Gumi, was the second and final release from this group before both Sakura and Otome Gumi became inactive in 2004. The group did originally consist of seven members, however Abe Natsumi left the group in 2004 after a scandal. This PV was requested by NyNy, as well as requested by Anni earlier on in my posts. This song is pretty old if you think about it. Sakura Mankai itself has been around for about 8 years now, long before I entered the Hello! Project fandom at all, but even before I created this blog I knew about Sakura and Otome Gumi, and I enjoy both groups' songs, with Sakura Gumi undoubtedly being my favourite of the two, mostly because I prefer the voices and choice of songs used for this group. Otome had some of the worst voices present (Rika and Sayumi) in the group, and I will be honest here, most of the members I don't particularly care about. I do like the songs, though, but not as much as I enjoy Sakura Gumi's songs. 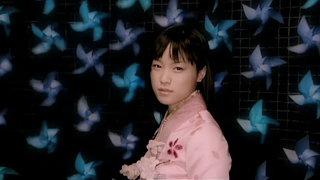 Thinking back to when I first heard this, I realise that this would have been the first, and quite possibly only, Enka influenced song that I have ever listened to... if this is even Enka, that is. 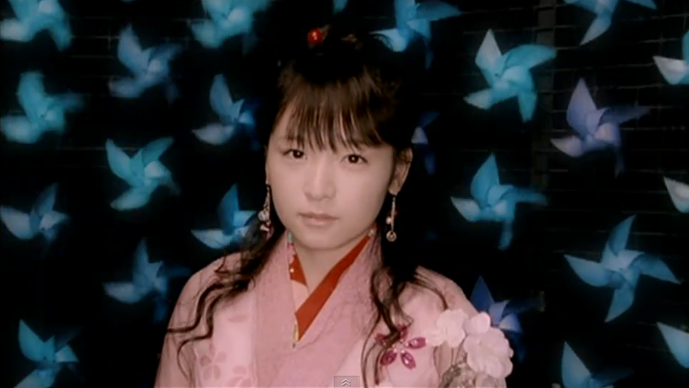 I don't listen to Enka, though I probably would if any Hello! Project artist happened to début in that area from the current line-ups. KonKon is befitting of a seamstress' job, don't you think? I didn't know that traditional Japanese women bleached their hair? Yossie! Stop sleeping on the job! Ah, crap! She spotted me staring at them legs! I absolutely love those costumes, the simple blue/green screen and the prettyness of it all! My lord, she really looks different... so youthful and refreshing! Kame's smile is so infectious and beautiful, you can really tell that she enjoyed every bit of this song, her smile and eyes don't lie. Oh, you're awake now, Yossie? KonKon just looks like an airhead here, or a space case... either one works, right? If I had been around the fandom when Mari was still in Morning Musume, hands down she would have been one of my favourite members. She's just perfection. Cute profile shot of the Kon-ster! Stare them all down, Gaki! Make them your fans!!! Yossie: "OHM NOM NOM NOM..."
Yossie is really hungry, it seems. 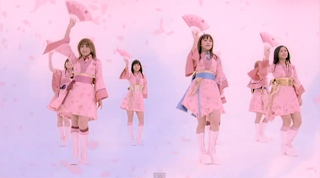 When I think of Sakura Mankai, I can't help but think of how good Morning Musume used to be, and how even the simplest things were beautiful. Right now you can see that the managers and directors are trying too hard with the group, and it only comes off as cheap and tacky, but here the greatest simplicity is used in the video, but the quality is a lot higher than most or nearly all of their recent stuff. 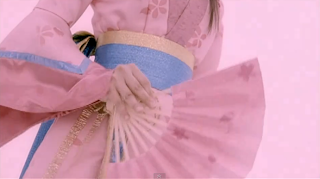 The video shows a more traditional side to Sakura Gumi. The girls where kimono and take on traditional activities, such as embroidery, flower arrangement, washing and watering the courtyard. 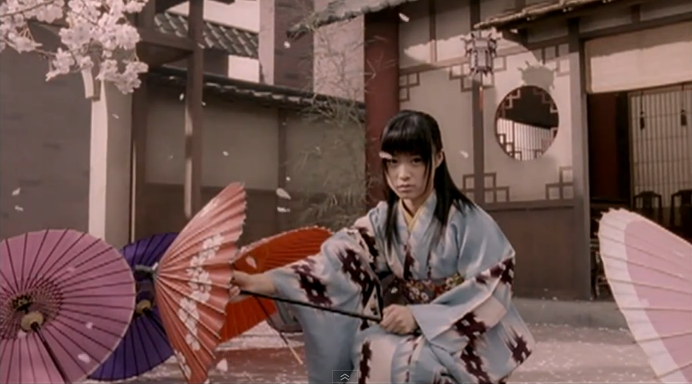 The courtyard itself and the look and feel of the video is extremely traditional, with only the dance scenes showing the modern side to the girls, such as their shorter, modernised Kimono and the boots they are wearing. Of course this video is a winner for me, and you will all know why; it's simple. 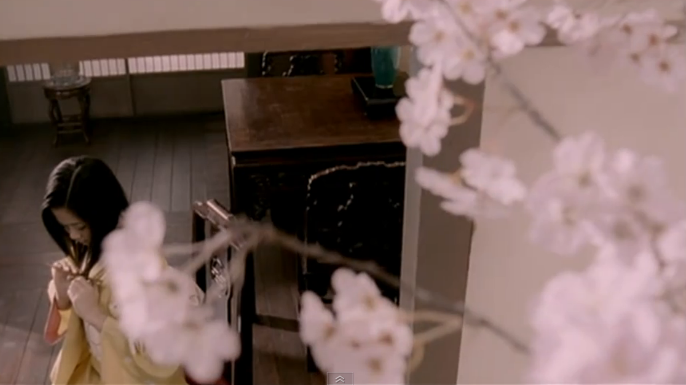 The beauty of the video is through the simplicity and how well thought out it is. The kimono's and courtyard itself were probably the most expensive of the video, but the layout and what we see is the simplest thing of all: A traditional spring in which the girls watch the cherry blossoms fall as they work or play. 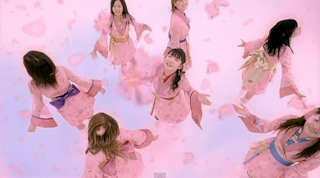 It's a very striking video, and whilst much does not go on other than the girls looking towards the camera, lip-syncing or doing their days work, it is extremely beautiful and well done, and this is essentially what is missing from most of Morning Musume's, and Hello! Project in general, today. 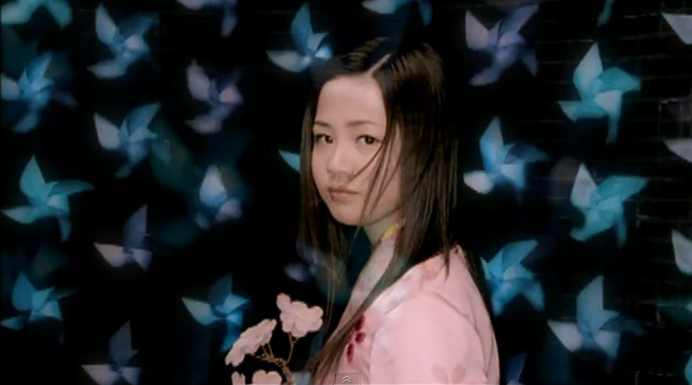 I like the video a lot, as I said it is very beautiful, but it isn't over-laden with effects either. 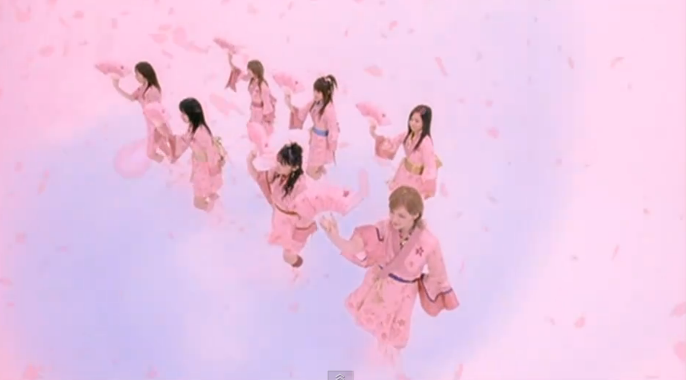 The green screen used is simple and effective, as if the girls are floating through the sky as they dance. The scenes used to show the traditional side to Sakura Gumi are also effective in how they are presented, showing us a traditional side to not just these girls, but Japanese women in general and how serene and beautiful they are before taking us back to the modernised girls in their short kimono and their well-paced dance moves. 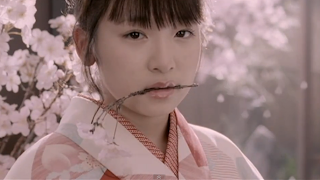 Both the song and PV are beautiful, and the simplicity works effectively here. I do honestly wish that Morning Musume could go back to this style of video, or at least the quality of the style. 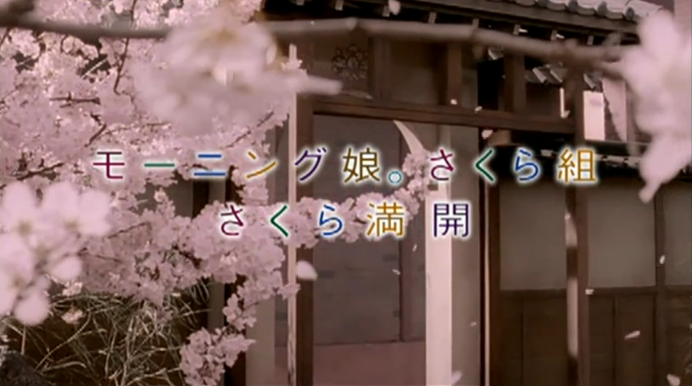 It's very high quality in how it was made, the look and feel of it, and what Morning Musume currently produce really does not reach this quality, it can't shine a candle to how beautiful Sakura Mankai on its own is. Yes, I wish that Morning Musume would be less cheap and tacky, especially in the effects department, and I am sad that I was not around for this song when it came out. 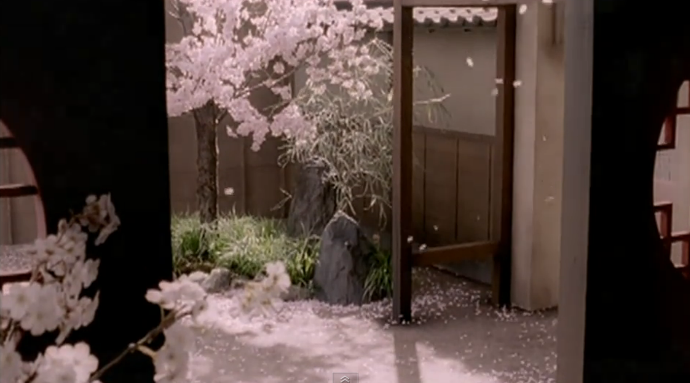 It's a gorgeous video, and the traditional song is just as beautiful and fits with the pace of the video. 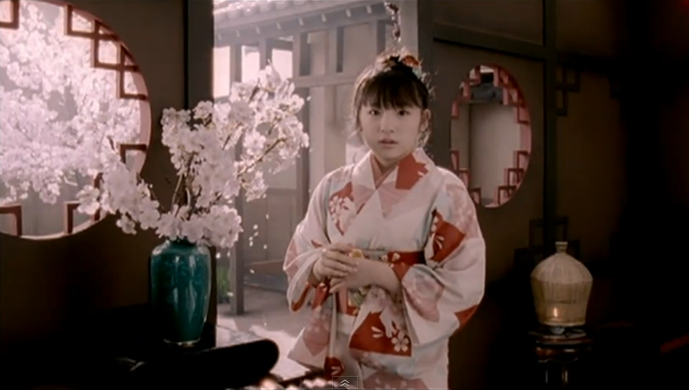 I love both song and video equally, and being one of the video's I enjoyed watching and listening to the most during my early days as a fan, I do treasure Sakura Gumi and what they created a lot, and I hope that one day Morning Musume can try to split the group again if they become more recognisable in the near future after Shige eventually meaning never graduates. Long story short, I love everything about Sakura Mankai. It doesn't try too hard to impress the audience because it doesn't need to. It's simple, but the simplicity is done effectively, and I enjoy it because of this. It also represents the girls so well and shows off their natural beauty wonderfully. I do wish that something like this came back into Morning Musume, but honestly, I don't think it will, and that truly is a shame, because this beauty has effectively been lost thanks to the abundance of useless, over-used sparkles and tack that the directors throw at the current Morning Musume. 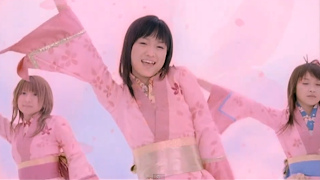 Simplicity is dead in Morning Musume, and that makes me sad. I always loved Sakura Gumi because a lot of my favourites are in it (KonKon, Kame, Aibon, Yaguchi and before also Nacchi). 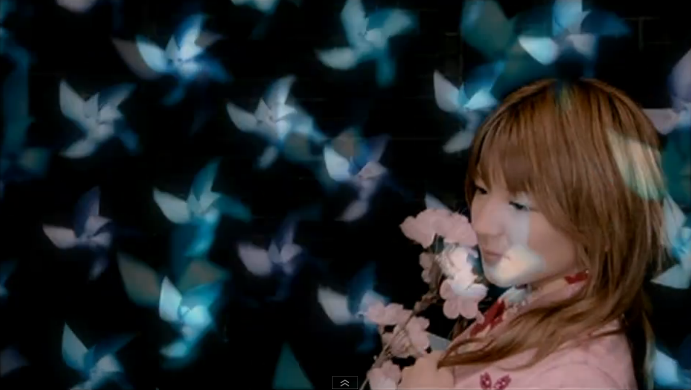 This song and pv is so pure and fresh, why don't they make pv's like this anymore?! I love Sakura Mankai with all my heart <3 In fact it is the first J-Pop song I ever listened to 6 years ago. 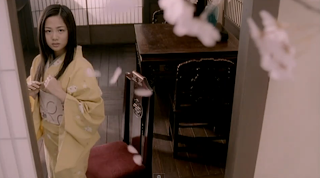 Everything about it just made me fall in love with the song and my interest in Japan grew even more. 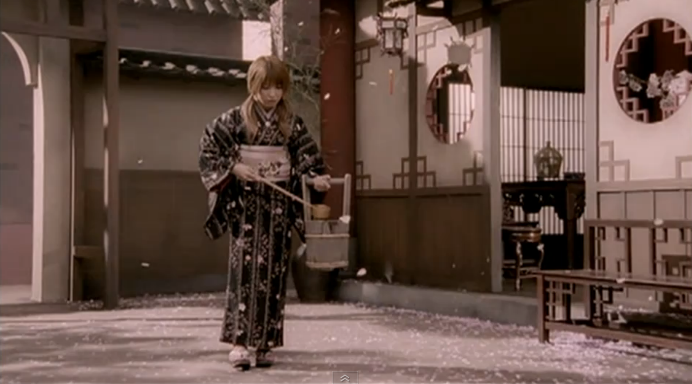 I guess because the PV gave me the usual Japanese cultural atmosphere that I love. 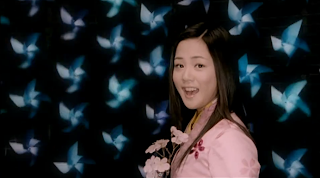 My first MM song was Say Yeah when I didn't know about them~ And I love the culture in the video, you can really see it. It's beautiful. This was probably the first Morning Musume song that I truly fell in love with. The arrangement is intricate and full, the melody is lyrical yet delicate, and the PV has a softly lit natural look that we never see from H!P anymore. I don't agree that this is a simple PV, though. After all, there are multiple sets, dance shots, solo lip shots, and that KILLER "girls biting things" shot. Lucky they had a long song to fit all of it! When I think of simplicity with this video, I think of how it looks; I do think that there is complexity behind it, but the product we get seems so simple, natural and pretty that you don't think about how hard it must have been to shoot and move everyone around. It's very effortless in how it looks, which makes me think it's simple - that, and you have barely any movement for a majority of the scenes like complex dancing and the natural look and tone of the video adds to the simplicity. This is a wonderful song and I have fallen in love with it; I loved it when I first heard it and I still do. It's beautiful and just so perfect.